This past Saturday, the Toronto Dingos AFC gathered for one last event in the 2012 season. Gone were the footy boots, the ripe unis, and the esky of beer guarded by a vigilant Dutchman. Instead, the Dingo boys doned their finest non-ripped jeans, button-up shirts, and classy jackets (corduroy, Wellsy? Really?) for their annual Awards Night gala. And with lights dimmed, it was obvious that the Dingos boys and girls were capable of polishing themselves up nicely...with the notable exception of Ramsey "Slept in a Gutter" Blacklock, who seemed to be getting an early start on Movember and Bearduary. President's Address: In his 5th year as club President, Craig Stewart is a veteran of this event and kept his remarks fairly brief (unlike this recap). Huge thanks were deservedly given to those who had made this season successful, including the club's executive, coach Mick McFarlane, and the club's sponsors. Specific mention was made of our newest sponsor, the Backpacker's Hostel, which signed on with the Dingos in 2012. "All we have to do is go there on a Saturday and drink," said Stewy while drinking his beer on this Saturday at Fionn's MacCool's. Stewy also singled out the Dingos Women's team and its members, noting that while 2012 did not go as planned, the club's hope is that 2013 will see a large growth in the women's game for the Dingos. Hear hear! Game Milestones: A large number of Dingos achieved significant game milestones in 2012. Ramsey Blacklock, Tom Bell, Tim Moller, George McCullagh, and Dan Prior each reached 50 games and were awarded an etched pint glass and a tall boy of sweet sweet Labatt 50 for their efforts. Dave Wells hit the century mark in his 9th season with the club, while Chris Buczkowski and Stuart Wallis each hit 150 games this year, only the 2nd and 3rd players in Dingos history to hit that milestone. Well done, all! Clubman Award: Voted on by the players themselves, this award goes to the member who goes above and beyond in his effort and dedication to the club, both on the field and off. With such a prestigious award, each of the nominees is honoured with a gift - this year Craig Stewart, Mick McFarlane, Justin Robertson, Jacob Steinberg, Chris Buczkowski, and Gary Conlon each received a fine cigar as thanks for their commitment. And while the sentiment in the room seemed to be tilting towards Gary "He's So Irish!" Conlon to take home the award, it was coach Mick McFarlane who triumphed. "This is the most important award that we give out," claimed Mick in his acceptance speech. "Or, at least it is until I see if I won the Best & Fairest award." Coach's Award: Mick and his assistant coaches, Justin Robertson and Butch Buczkowski, presented this year's Coach's Award to Patrick Bossey for his great work on the field and at training. In his acceptance speech, Patty gave a heartfelt thanks to all those who made his rookie campaign so memorable. The dusty room also seemed to affect Patty's inflammation in his tear gland, or perhaps he'd been cutting onions (making a lasagna for one?). That's a Flight of the Conchords reference, people. Get on it. Denis Cormier: While the rookie couldn't make it to the event, the hardware kept piling up for this young Canadian. Denis won both the Most Improved Player Award and the Rookie of the Year Award. Accepting the award on behalf of Denis, 2011 MIP winner Ramsey Blacklock was outraged at losing the award to a faster, younger, and more handsome man. "I'm outraged that I lost this award to a faster, younger, more handsome man," Ramsey said bitterly. Division 2 Best & Fairest: In a contest that went right down to the wire, rookie Gary Conlon pulled off the victory, winning the Div 2 B&F by a close margin over Steve Gordon. Surprisingly, in an acceptance speech laced with Lucky Charms, jigs, and heavy drinking, Gazza did not make one reference to Star Wars. 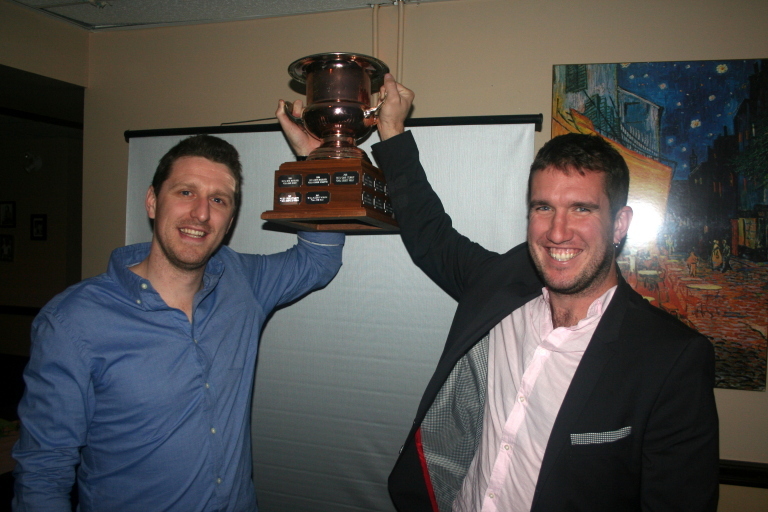 Division 1 Best & Fairest: To no one's surprise, Tom Bell took home the Best & Fairest Canadian award for the Dingos. After previous 2nd and 3rd place finishes, 2012 was the year that Tom dominated the vote count and had the highest total overall. In an attempt to be gracious, Tom made note of the physical absence of some key Canadians in 2012 (Spider, Ando, Karas) and the mental absence of others (Jimmy), however, this honour was a well-deserved one for Tom. Coming in 2nd place was Yoni Moussadji, who was most likely hurt in the vote count by his lack of name recognition. On the Aussie side, a tight race developed as the vote count continued through the evening. Craig Stewart, Mick McFarlane, Justin Robertson, and Geoff Hansen all made a run at the top of the leaderboard. However, it was Anthony "Red Card" O'Brien who overcame his constant disciplinary issues to emerge victorious, capturing his first B&F award and ending Stewy's two-year reign. Stewy had to settle for 2nd place. Well done to both OB and Tom! Huge thanks to all those who made the Awards Night possible and to Fionn MacCool's for being such great hosts!